Like stepping into a time warp and arriving all the way back to the summer of 1969, to the most famous music festival of all time, Woodstock. Releasing their first single ‘Go Down Easy’ on the 31st March, Mt. Fuji brings to life that golden age of music that stirs the heart and soul and bringing people together in the spirit of love and dance. 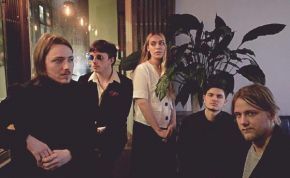 Guitarist and vocalist Freddy Price took some time out to give us the lowdown on the bands fashion, festivals and fans. PR: Tell me a little about yourself as a group. FP: We are a five piece band. Originally myself and Dominic Lawson (drums and recording engineer) started working on the songs together, purely as a recording project as Dom had access to Spirit Studio and I had a lot of songs I wanted to work on with someone. When we realised we worked well together we decided that we should play the songs live, so I booked us our first gig at Zombie Shack to put some pressure on us to form a band. Henry Crabtree (guitar) and I used to play in a band called Good Foxy, and when Henry found out the gig was coming up, in the Black Lion pub where I work, he said “I’ll play guitar with you.” That was a real bonus because Henry is a great guitarist, we had existing musical chemistry/unfinished business and he already knew Dom. Next to join was Paris Taylor (vocals). We all knew her from her solo gigs, she’s a great singer and her and I had been threatening to record a song together for about a year before we finally sat down and wrote “Come Alive” which is the centrepiece of our set at the moment, based on a song Paris already had. I was so excited to discover that Paris was a talented songwriter as well as a fearsome vocalist. But it took its time to come to fruition. The final piece of the jigsaw was put in place when an advert placed on the wall of a Manchester Music College was answered by Connor Synnott, a bass player who is studying for a degree in Music Business (as is guitarist Henry) and who Henry and I had already played many gigs on the same bill as during our time together in Good Foxy. Connor is very pro active in the music scene and his attitude to promotion is very refreshing. This band has a lot of drive, not just in the musical sense but also in the industry side of things which is something bands themselves have to do in the early stages of their life cycle. PR: This is your first single, has it been a long time coming? FP: This song was written last Summer in the dining room of a friend, Johnny Woodhead. Johnny and I had just recorded a demo of a song called “Well Well Well” and he was in the front room rehearsing with his (brilliant) band South Island Son. Johnny has been a great support in the early stages of Mt Fuji, as a musical mentor. I showed Dom the song and he came up with the rhythm and altered the structure. We took it into Spirit Studio and worked on it very quickly to get the basic tracks down, probably two 4 hour sessions. Then we got a bit delayed because Adam Benfold and Andy Tomlinson who assisted Dom with mixing and mastering are both extremely busy guys! So in short yes, it’s been 9 months in the making - like a human baby. PR: Thereʼs a lot of Woodstock in there, is that intentional? FP: Interesting that you picked up on that. The film of the original Woodstock Festival is my favourite film, and I also love Easy Rider. They were both released in 1969 which is important as the year the sixties died, a decade which was arguably the Western world’s most artistically creative period. It wasn’t intentional but I was 8 years old when I was shown the Woodstock film and it has shaped my life experience in more ways that I can mention. As this song was basically made by Dom and myself, with the exception of Paris’ vocals, perhaps there will be a lower Woodstock ratio on the upcoming tracks we have in the can, which will feature the whole of Mt Fuji. PR: Whatʼs the drive, the inspiration? FP: The inspiration is to make great music that people can dance to, with lyrics that are real. Music to us is about feeling, heart and soul. PR: What has been the response so far? FP: The response has been very positive. It’s early days yet but there is a lot of drive from every member to perform their role passionately and professionally and to deliver the songs well so the future looks exciting. PR: Is this at present a one off? Can we expect an album soon? FP: This is not a one off, no. You can expect an EP, don’t be greedy! We have 3 more singles planned. We are planning to release an EP by Summer. An album is a big statement so that should come next year. But if we can get the studio time it would be nice to bring that forward. PR: What are the dynamics within the group? FP: That’s hard to say. There is a drive to be selfless musicians and to express our creativity within the tight framework of a song rather than to get sidetracked by endless jamming, which is not what this band is about. PR: Any live shows planned? FP: We have a gig on 18th May in Leeds at Mabgate Beach. We also are playing at Darwen Live at Sunbird Records on May 26th. PR: How would you describe your look? FP: Oliver Twist meets Elvis Costello and Stevie Nicks at a John Cale gig in Barcelona. PR: How would you describe your fan base? PR: If you could play at any music festival which one would it be and why? Woodstock man. Current ones - it would have to be Glastonbury as I can never seem to get hold of a ticket for it as a punter. PR: If you could be support act for any musician (s) who would it be? FP: In terms of new bands, I love The Orielles. It would be nice to play with them one day. But I’d love to play alongside so many dead legends - Johnny Thunders, Lou Reed, Kurt Cobain. PR: This is a most exciting start for the band and the perfect track to lead us into to warmer days. Thanks to Freddy Price for his time and to all the members of Mt. Fuji. Also to Jack McKenzie for the bands promotional photograph and to Martha Jane Taylor for album artwork.